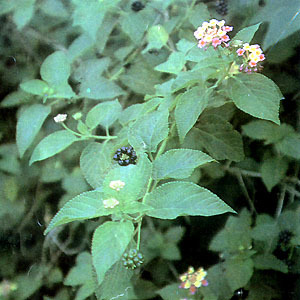 Kantutay – Scientific name: Lantana camara L.
A gregarious, erect or half-climbing, somewhat hairy aromatic shrub; when erect, usually 1.2 m high and when scandent, twice as high. Branches four-sided with recurved prickles. Leaves: ovate, 5 to 9 cm long, pointed at the tip and rounded at the base and toothed in the margins. Flowers: pink, orange, yellow, white, lilac and other shades, according to the variety and borne in stalked heads which are 2 to 3.5 cm in diameter. Calyx small. Corolla tube slender, the limb spreading, 6 to 7 mm wide, and divided into unequal lobes. Stamens 4, in 2 pairs, included. Ovary 2-celled, 2-ovuled. Fruits: Sweet tasting drupaceous fruit; purple or black, fleshy ovoid, and about 5 mm long. A gregarious weed in the Philippines. Certain varieties are cultivated as a trimmed hedge either alone or with other shrubs. Dried flowers: volatile oil, 0.07% – caryophyllene-like bicyclic terpene, 80%, l,a-phellandrene, 10-12%. Leaves, bark, roots, flowering tops. May be collected throughout the year. Root: sweet and bitter tasting, refrigerant, antifebrile. Leaves: minty tasting, cooling natured, antiphlogistic, anti-dermatoses. Flowers: sweet tasting, mildly cooling, hemostatic. Influenza, cough, mumps, incessant high fever, malaria, cervical lymph node tuberculosis: use 30 to 60 gms dried roots or 60 to 120 gms fresh roots in decoction. Fever: Take decoction of bark or infusion of leaves and flowering tops as tea. Hemoptysis, pulmonary tuberculosis: use 6 to 9 gms dried flowers in decoction. Dermatitis, eczema, pruritus: use fresh stems and leaves. Rheumatism – Spread oil on leaves, warm over low flame and apply on affected part. Sprains, wounds, contusions: Use pounded fresh leaves applied as poultice. This entry was posted in List of Medicinal Plants in the Philippines on March 19, 2009 by Pinoy Herbs. website very funy and good. Dear Director, I am a priest herbalist and have come across information on the medicinal values of Lantana from you and am very impressed. I will try some of it and will let you know the results. do keep in touch with me through my email. Knowledge is sharing. Bye and Happy Xmas in advance. dear author, is lantana camara effective in treating termites? is lantana camara effective in treating pests like Brontispa longissima? Is lantana camara is effective in treating pulmonary tuberculosis? ?